A wide range of styles can be found within the small home movement. Unlike tiny homes which often tend to be built on wheels, small homes are permanent structures. According to Wikipedia, the difference between a tiny home and small home is the square footage. Small homes range from 400 square feet (37 square meters) to 1,000 square feet (93 square meters), where a tiny home is no larger than 400 square feet (37 square meters). A Craftsman-style home is unique, according to Wikipedia, in that it was born as a response to the Victorian home movement and incorporates a less lavish and more natural look. Arts & Crafts Style states that a Craftsman home can be easily recognized by a combination of exterior and interior features. Gabled roofs with decorative braces underneath, dormer windows, large overhanging eaves, exposed rafters and beams, a large front porch and a stone chimney are often outside characteristics of the Craftsman style. Inside, the architects design open floor plans, lots of windows, built-in woodwork, exposed rafters and usually a central fireplace. Often, natural woods are used. 1. 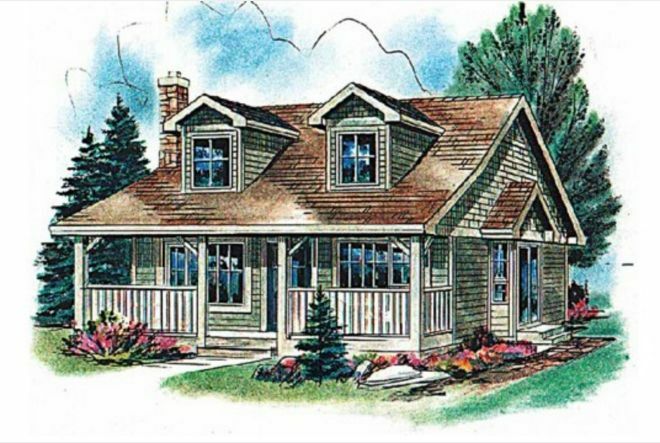 Classic cottage by House Plans. This classic-style cottage is 950 square feet (88 square meters). 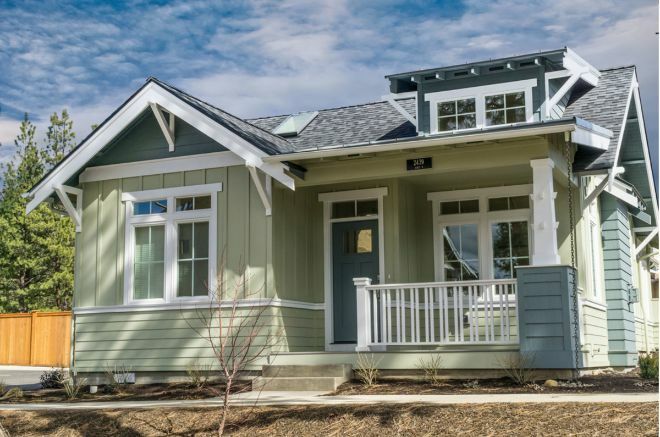 In the tradition of Craftsman-style, it has a large wrap around porch. 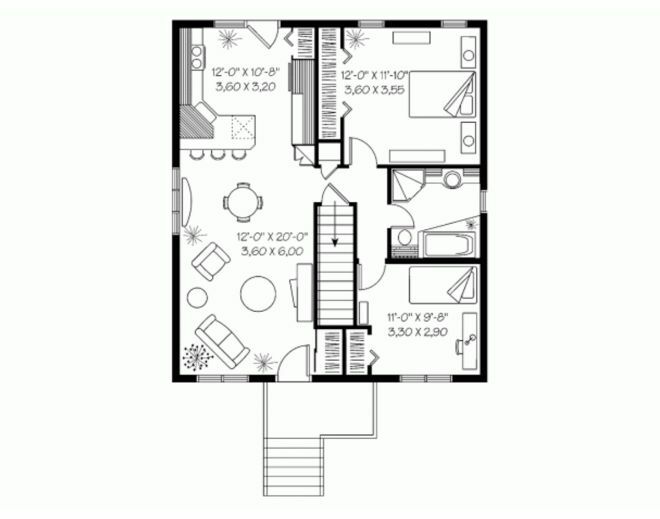 With two floors, the bedrooms are placed on the second floor along with the full bathroom. Dormer windows let in plenty of natural light. The downstairs has an open floor plan that joins the great room and dining room together. The half bath is also on the first floor. 2. 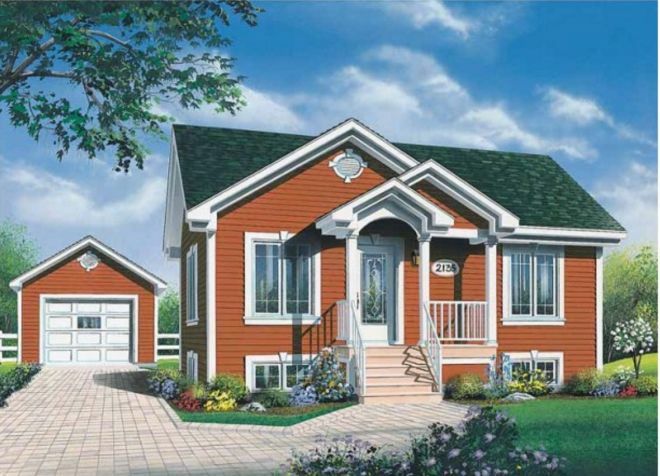 2-bedroom cottage by Home Plans. 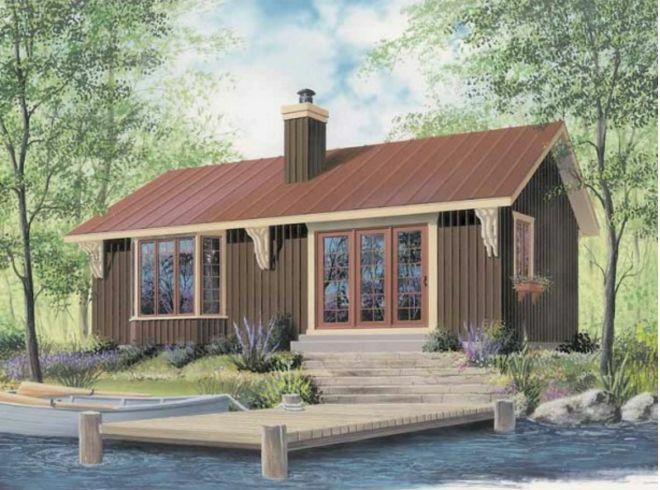 Home Plans cottage is a single-story home of 736 square feet (68 square meters). 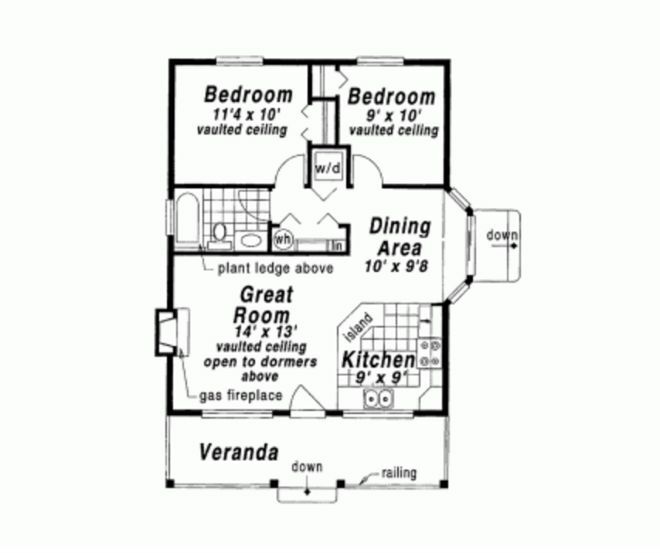 The two bedrooms are in the rear of the home and share the one bathroom. Dormer windows let plenty of natural light into the home. Vaulted ceilings keep the home feeling spacious. A front porch stretches the entire length of the front of the house, perfect for sitting on in the morning and evening. 3. 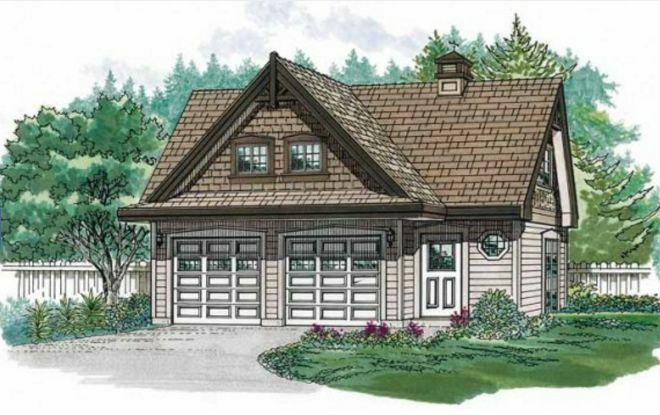 2-garage craftsman cottage by Floor Plans. 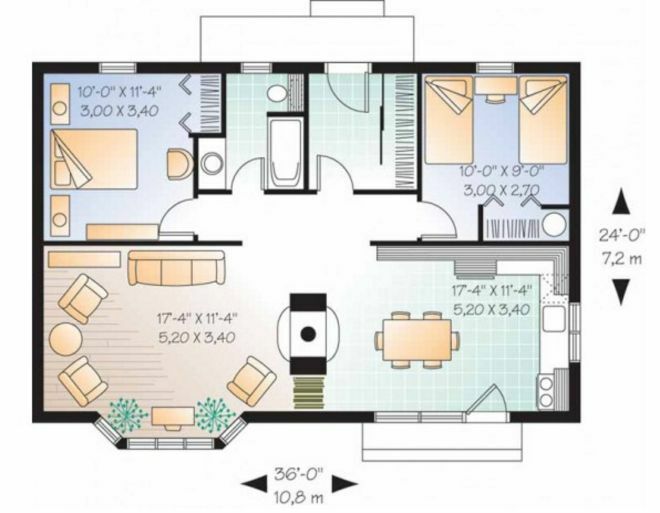 Floor Plans' two-garage cottage has 914 square feet (85 square meters) and 967 square feet (90 square meters) of storage space in the loft. 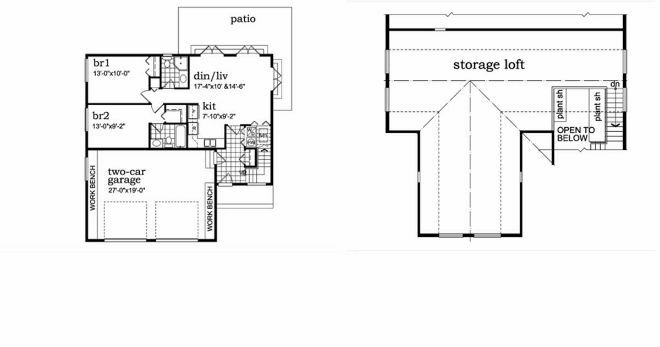 The two bedrooms, each with their own bathrooms, sit behind the garage. The kitchen, dining room and great room all join together for an open floor feeling. A large patio sits off the rear of the house. 4. Craftsman bungalow by Architectural Design. With 960 square feet (89 square meters), this Craftsman bungalow is one story and has only one bedroom. For the guest that wants to spend the night, a nook is built-in with a bed off of the great room. Plenty of windows and dormers let in natural light. This home has both a large front porch and a large back porch. Owners can decide where they want to sit and enjoy some time outdoors. 5. 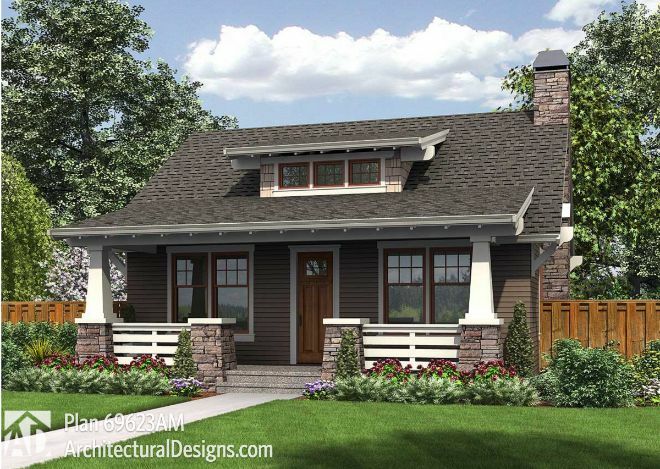 Traditional craftsman bungalow by House Plans. 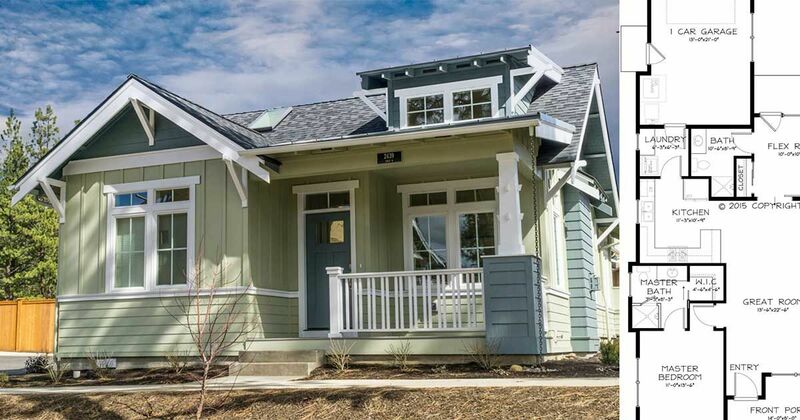 House Plans' craftsman bungalow is a single-story home with a slightly smaller front porch, but it offers 999 square feet (93 square meters) of usable space and a one-car garage. The inside has a master bedroom with a walk-in closet and a flex room that can double as a guest room. The great room and kitchen all flow together, allowing people to easily mix and mingle. The great room has a wonderful window seat built-in. 6. 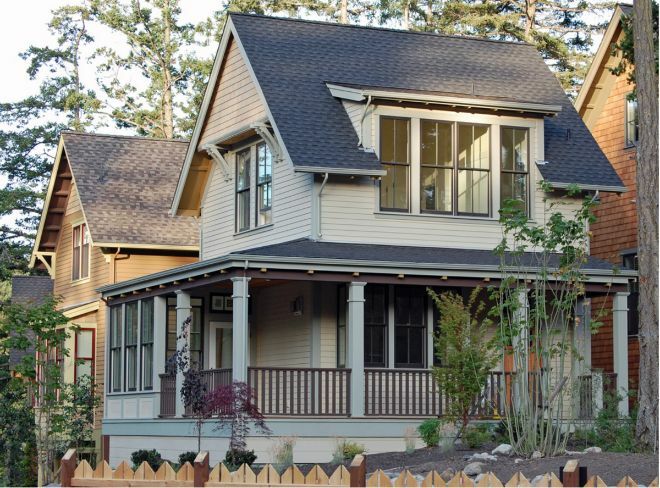 Craftsman cottage by Dream Home Source. With 874 square feet (81 square meters), the cottage by Dream Home Source puts everything on a single floor. 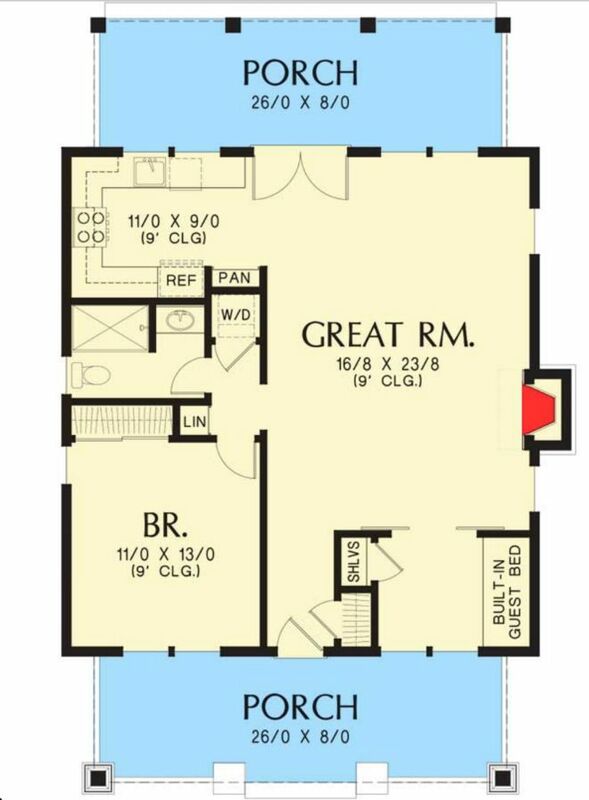 The two bedrooms are in the rear and share one bathroom. The kitchen and living room are in the front, with only a fireplace separating them. A bay window in the living room gives just a little more space to the cozy room. 7. New American bungalow by EPlans. The New American bungalow has 896 square feet (83 square meters), two bedrooms and one bathroom. The bedrooms sit to the right of the entryway and share the bathroom. In the back of the house is the kitchen. The dining room and living room are an open floor plan, helping make the home feel spacious. The variety within small homes allows those who want to downsize and go green to still find a home that reflects who they are. A home is not just where you sleep; it reflects who you are, so having choices while being earth friendly is the perfect combination.